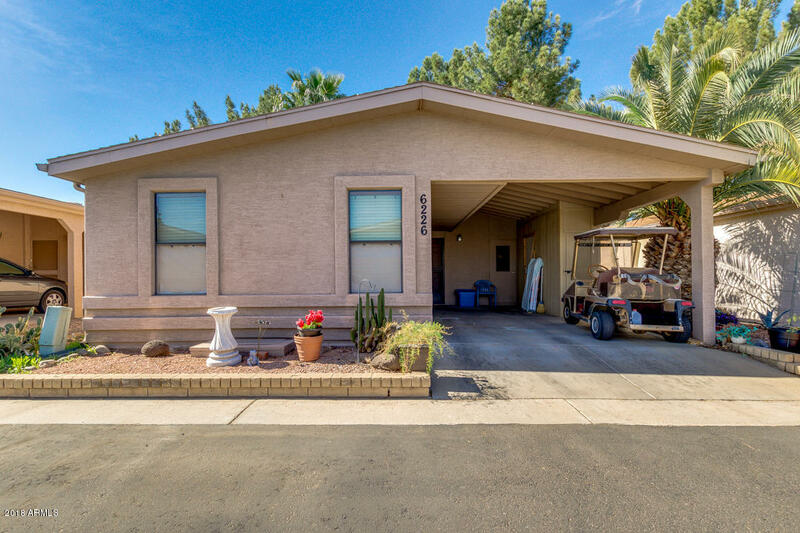 1 Bed, 2 Bath, in SunBird Golf Resort, Chandler. Wonderful location backing up to Tennis Courts and Post Office and within Steps of the Club House and Restaurant. Enjoy setting out on your open Back Patio in a Park Like Environment. Updates Include: Stucco Exterior, HVAC 3.5 Ton 13.5 SEER, Plumbing, Refrigerator, Washer and Dryer, Tile Floors in Hallway and Bathrooms, Hot Water Heater, Second Storage Shed and Overhead Carport Storage. Amenities: Executive Golf Course, Driving Range, 43,000 sqft Clubhouse, 7,600 sqft Ballroom, Restaurant and Bar, Heated Pool and Spa, Health Club, Billiards Room, Tennis, Pickleball, and Bocce Ball Courts, Post Office, Library, Lapidary Room, Ceramic Room, Craft Room, Bike/Walking Paths, Fishing Lakes and Horseshoes.